Texplainer: How do you navigate the Senate intent calendar? At this point in the session, there are a lot of bills on the Senate’s “intent calendar.” How can you tell which bills will be considered on a given day? Today’s Texplainer is inspired by a question from Texas Tribune reader Alex Meed. Hey, Texplainer: How do I know what days the bills on the Senate intent calendar will be brought up on the floor? For starters, the Senate intent calendar is a long list of bills that could come up for debate on any given day. A Senate bill can’t pass the upper chamber (let alone get signed into law) unless it’s been placed on the calendar somewhere along the road. During the first 130 days of the session, Senate rules require a bill to stay on the calendar for two days before it can be debated, and senators must give daily notice to keep bills that don’t get brought up for debate to stay on the calendar. So, to keep their bills in play, senators must keep up with the intent calendar. A committee votes to advance a bill for full Senate debate. It’s placed on the “regular order of business,” an ordered log of all the measures passed out of committee. The bill sponsor files a notice with the secretary of the Senate to get the bill on the intent calendar. You would think the Senate then considers bills according to their intent calendar dates. But this doesn’t always happen. First of all, the Senate can only take up bills advanced from the House on certain days of the week (House bills are also placed on the intent calendar). And Senate bills need the support of three-fifths of the senators — at least 19 members — in order for the sponsor to ask Lt. Gov. Dan Patrick to potentially bring the bill to the floor for debate. In other words, a bill can be placed on the intent calendar but not be discussed that day because it doesn’t have the support needed to be referred for debate. That means some bills die on the intent calendar without ever being discussed in the full Senate. If you can’t find a specific bill on the calendar, you can contact the author's office for more information about when it might be put forward (and you can always find contact information for your representative in The Texas Tribune’s elected officials directory). For bills that do make it onto the Senate’s calendar and muster the necessary three-fifths procedural vote, Patrick still has the final say as to whether the bill gets a full floor debate. 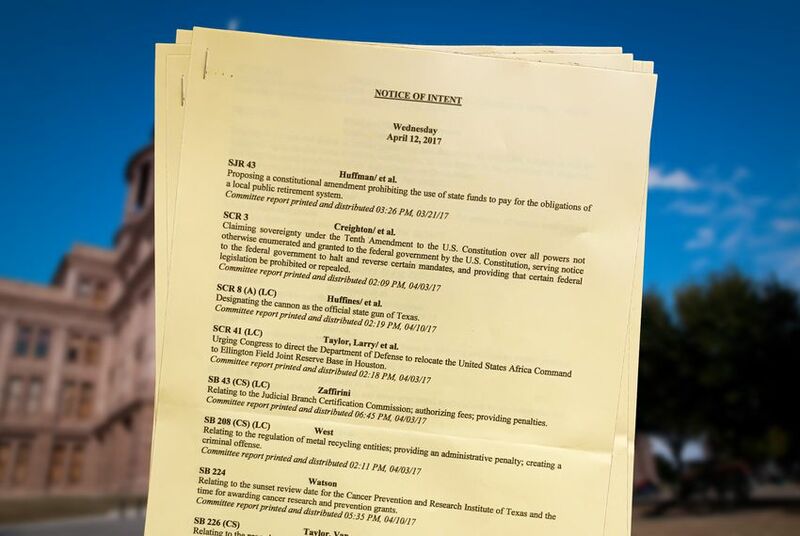 The Texas Legislature keeps the intent calendar updated here, but it’s ultimately up to the bill sponsor to keep his or her bill on the Senate’s daily agenda — and up to the lieutenant governor to allow debate. Bottom line: There’s no surefire way of knowing when bills on the Senate’s intent calendar will be brought up for consideration on the floor. The intent calendar is useful for knowing which bills might be considered, but the lieutenant governor has the final say.